I read three guidebooks on this walk before going and none of them mention the word “bog”. I’m going to mention it. A lot. In fact, take the “Bog Factor” and turn it up to eleven - this is one for the wet sock lover! It all started innocuously enough. From our start point up Glen Banchor from Newtonmore, we took a dry, easy track up the Allt a’Chaorain. There’s a wee cairn on the left, just before this track meets the river, which leads to a hidden bridge. It’s worth noting that the bridge is now in disrepair so go carefully – or perhaps heed the warning signs and ford the river instead. After all, it’s not a day that’s going to end with toasty toes! The path now starts to climb relentlessly through heather, peat hags and tufty grass. There’s an old hut and a faint path but little else to mark the way until you come to a level area with peat hags and a dark lochan. (Am I selling this one to you yet?!) We kept climbing NE almost directly to the summit, missing out the col on the guidebook routes – a short, sweet climb to the cairn which took us about 2hrs from the carpark. Taking a bearing through the swirling clouds, we headed down the steep cleft which separates this from our second Munro – Carn Sgulain. Thinking about it, a direct line would work just as well since there’s no real path and it’s only 2km away. We picked our way through peat hags, heather and grass to the bottom, then struck uphill almost due north. There are plenty Ptarmigan up here – superbly camouflaged in granite grey and lichen white. It’s always alarming when that stone you were heading for gets up and trots off…..! 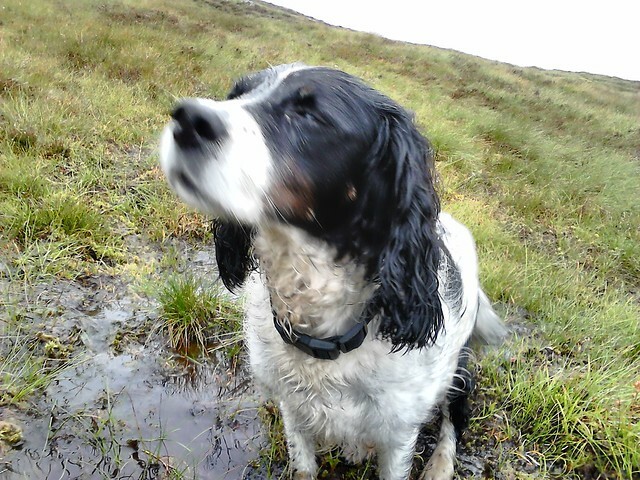 Dog in a Bog was most definitely on the lead for today. As we neared the rounded summit of Carn Sgulain (2hrs 45min) we spotted the old fence line that would become our new best buddy. It marches off west then south-west to the final, and best-looking, of the day’s hills. And here’s where the fun starts. 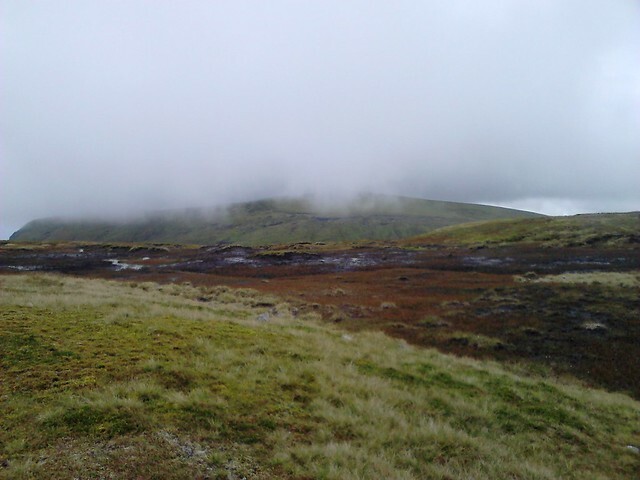 Over the undulating plateau you meet - The Bog. In all shades, textures, depths and guises, The Bog is a faithful friend right up until the peak of Carn Ban. “Porritchy” was our best description of it. The route west leads through, round, beside, and sometimes under this spongy expanse. Occasionally “island-hopping” seemed the best way forward - from one grass tussock to the next. We met a couple walking our route the other way round about here. “It’s all bog!” exclaimed the Woman with a Pink Rucksack, looking a little forlorn. We wondered if we should warn them that it got worse or if her measure of “all bog” could be more accurate than ours? Surely not….we’d been to Bog City and got the T’shirt, hadn’t we? 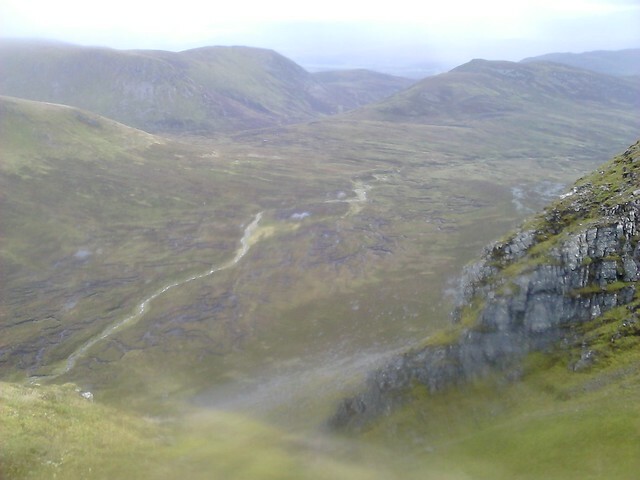 We climbed on through a lively shower to the rocky top of Carn Ban. The wide-open view begins to focus more here and we marvelled at the cliffs of our final Munro and the Biblical Bog glistening on the plain below it. The summit of Carn Dearg (5.5hrs) was beautiful – a fitting sight for my 60th Munro (hurrah!). 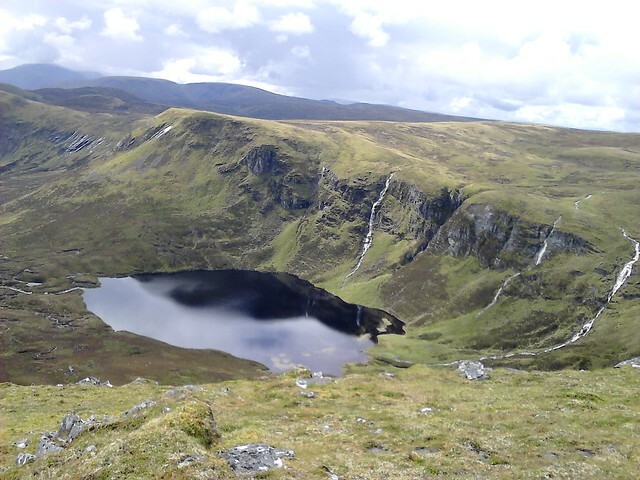 If you amble off to the west of the ridge there’s a high view of Dubh Loch. Freshly filled waterfalls plunged over the edge of the mountain and ribboned down the rock to its surface. The breeze carried across the sounds in short bursts – magical. Been missing The Bog? Fear not, here we go….The descent we took heads south down to a sizeable gully below the final marked cairn on the ridge. From here it’s every walker for themself! 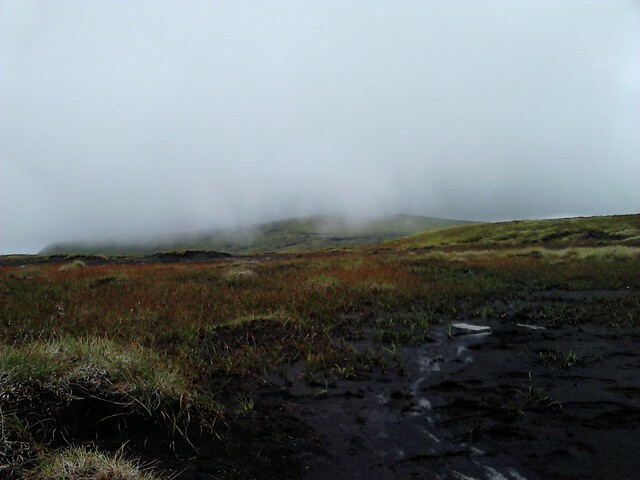 There was no obvious route to the bottom of Gleann Balloch and path turned to stream turned to….Bog. It’s a foot-soaking hike from here to cross the stream. Our map showed a path running south- east down the other side of this stream and finally turning east back to Glen Banchor and the River Calder. On the ground there’s little to see except faint vehicle marks – more squashed grass than anything. We did spot the odd boot mark but more were deer prints. Our boot-soaking continued all the way back to the bridge upstream of where Gleann Balloch meets the River Calder. Then it’s a beautiful, dry, well-made, solid track back to the carpark! Lucky we had dry socks and shoes in the car. Lucky Dog in a Bog’s tail never stopped wagging. Lucky we didn’t lose a boot! And by the way, Woman with a Pink Rucksack – you win! Re: Beware of the Bog! Thanks for the heads up, we'll keep that for a dry or frosty spell. Yep, that's exactly how I remember it. As you say it is pretty boggy.